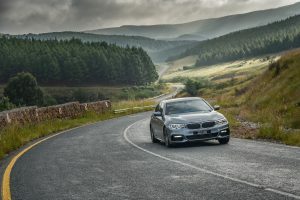 The BMW 5 Series which has been updated is pretty top notch driving, and the 530d was given a comprehensive 7 day test. The 530d looks impressive and drives like a dream as well. Gone are the days of a bloated body and too little power for the 5 series. It comes with a variety of engine options and there was never a moment of power envy on the launch day, as well as the test. Generation 7 is labelled as a business athlete, being aimed squarely at the corporate business types, and it certainly doesn’t disappoint. It has a muscled, athletic look about it, and it has slimmed down as well to be 100kg lighter than its predecessor, which obviously enhances performance. 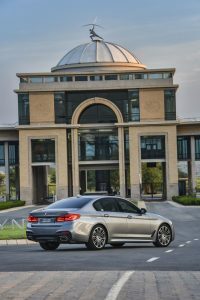 There will be references made about the 5 series resembling the 7 series, and this will ring true as many design cues have led to the smaller siblings design. The 5 series is slightly longer and wider than the previous generation, which leads to more leg room & head room. It also has a 530L boot, which is pretty cavernous. LED daytime driving lights come as standard. Adaptive LED Headlights with variable light distribution and BMW Selective Beam anti-dazzle high beam with a range of up to 500 metres are available as an option. The cabin has a luxurious and spacious air to it that gives you a corporate or business feel when inside. It has top end leather seats, an ergonomic and sweeping dash board, with a 10.25’’ media screen which gives you all the driving info & settings that you would ever need. The voice assistant is great and speaks in most languages. It has a heads up display with a 70% ability to increase size for easy info on speed etc. It has telephony with wireless charging facility. The remote services are great, and switching on the car whilst inside are awesome on a warm day. You set a time when you will be in the car, and voila! It cools the car until you hop in and drive away. You can also see what fuel consumption etc you have done, and what range you have left in the tank. It has an ooptional Bowers & Wilkins Diamond surround sound system with diamond dome tweeters, brilliant sound quality and 1,400 watts of output. 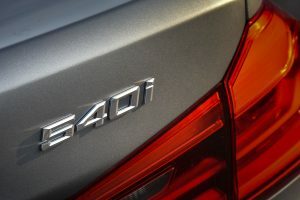 The 530d has a six-cylinder diesel 2993cc engine mated with a 8-speed Steptronic auto gearbox, which is as smooth as silk. It pushes out 195kw @ 4000 rpm & 620Nm of torque @ 2000 rpm. It is pretty frugal, and has a claimed 4.5L/100km, whilst we got around 7.2L around the city. The 530d model we drove had the M Sport package which adds sporty appeal- It includes the M aerodynamic package (front apron with larger air intakes, side skirt trim, a diffuser-style rear apron and an exhaust system with two rectangular tailpipes), lowered M Sport suspension and M light-alloy wheels in 18-inch (optional 19-inch) format. Inside the car, M sports seats with Alcantara covers highlight its sporting focus and are joined by the new M Sport leather steering wheel, exclusive floor mats, interior trim strips and aluminium pedals. All equipment lines and the M Sport package also offer customers the option of Sensatec covering in the colour shade Coffee for the instrument panel and shoulder area of the side door panel trim. The 530d drove well to say the very least. It has sufficient power, and gets up to speed quickly, and keeps going well over the 200km/h mark. It handles very well, but it has the drive systems as stated before to do this such as integral active steering, and doesn’t feel heavy at all. The double-wishbone front suspension & 5-link rear suspension keep it smooth and on point. It has three modes of drive- namely eco, comfort & sport which give levels of performance. Drive systems are plenty- Active Cruise control helps with keeping fuel consumption in line, and I don’t know how anyone does without this now. Hazard preview based on car-to-car communication. If vehicles which are part of the inter-connected BMW fleet detect a hazard, for example an accident, a broken-down vehicle, dense fog, heavy rain or ice, this information is immediately relayed to the BMW backend and incorporated in the form of a hazard preview into the navigation system and screen of vehicles in the immediate vicinity, alerting them in advance to the upcoming danger. Lane-change assistance and side collision protection. 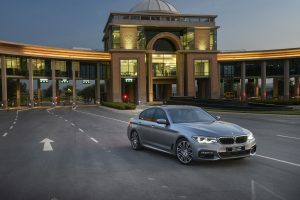 The optional Driving Assist Plus safety package for the new BMW 5 Series Sedan comes with a host of new functions. These include the Lane Keep Assist, which helps the driver pre-empt hazards by automatically applying corrective steering in three types of situation: if the system detects that the vehicle is about to leave the road, if the driver is about to change lane and has overlooked a vehicle in the next lane or if danger is detected due to an approaching vehicle. The Lane Departure Warning system operates at speeds between 70 and 210 km/h. If the stereo camera detects that the vehicle is straying from its lane, it actively helps the driver steer back on course with smooth and seamless steering interventions. Lane Change Warning steers the vehicle back into its lane if its sensors detect another vehicle in the next lane, for example in the driver’s blind spot. Finally, Side Collision Warning, which operates at speeds between 30 and 210 km/h, warns drivers by means of a visual signal or steering wheel vibration if another vehicle is encroaching from the side. If the system detects sufficient room on the other side of the vehicle, it correctively steers the vehicle in this direction and so out of the danger zone. This corrective steering assistance can be overridden at any time by the driver. It comes with a 5 year/ 100 000km Motorplan & BMW on call. This car was phenomenal and it is a car that any corporate manager if he has that as a budget would want to drive.